Answer: The accounting method specified the way of income and expenses are reported for taxation purpose. Individual or an entity should keep records of income and expenses according to General Accepted Accounting Principles [GAAP]. Tax Accounting should be related on prevailing standard of the country. In the absence of such standard any pertaining international principles specified by the Internal Revenue Department should be used. According to Income Tax ACT 2058 accounting methods to be applied by different tax payers are summarized below. Question No. 2: What is Tax Accounting method? How amounts are treated under Cash Basis and Accrual Basis? a. Cash Basis Accounting: Any person or an entry records the income when received cash and records the expenditure when cash paid for tax purpose is known as cash basis accounting. b. Accrual Basis Accounting: Income is recorded when arise right to receive and expenditure is recorded when obligation to pay raise for tax purpose accounting is known as Accrual Basis of accounting. It ignore when received when payment of cash. Question No. 3: How long term contract has been defined in the act? What is the provision for recognition of income and expenditure for such contract in the act? Answer: The term of contract which exceeds 12 months related to manufacturing, contraction and installation is known as long term contract. Under long term contract incomes are recorded when received from employment, business and investment but expenditure are recorded on the basis of percentage of contract completed. 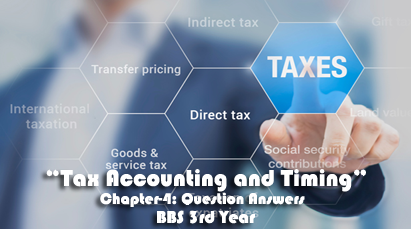 0 Response to "Tax Accounting and Timing [Model Questions and Answers] | Unit-4 | TAXATION | BBS 3rd Years | NOTES"